BIONICS FOR BLINDNESS. Think exceptional sight would be a cool superpower? You’re in luck: Researchers from the University of Minnesota have built a bionic eye prototype that could restore sight to the blind and give superhuman vision to those who can already see. They published their research on Tuesday in the journal Advanced Materials. LIGHT CONVERSION. The researchers used a custom-built 3D printer to construct their bionic eye prototype. First, they printed a base of silver particles on the inside of a hemispherical glass dome. Next, they used semiconducting polymer materials to print photodiodes, devices that convert light into electric signals, on top of the silver base. The entire process took about an hour, after which the team had a bionic eye that could convert light into electricity with 25 percent efficiency (safe to say that’s less than our natural eyes can do, since they can detect a single photon). A FIRST STEP. We won’t be able to transplant this eye into a human any time soon. A glass dome probably wouldn’t feel great in a person’s eye socket, so the team is trying to figure out a way to print on a soft hemispherical material. It also wants to add more light receptors to increase the device’s efficiency. 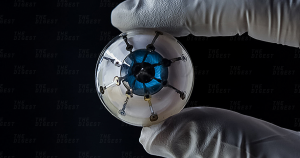 Still, as co-author Michael McAlpine noted in a press release, the team’s prototype is a significant step forward toward the goal of creating usable bionic eyes. First, it shows that the 3D-printed semiconductors are just as efficient asthose found in devices produced in microfabrication facilities, high-tech labs outfitted with cutting-edge equipment researchers use for small-scale engineering. Since 3D printers can do basically the same thing, more researchers could now start working on their own inventions that use the semiconductors, no matter whether or not they have access to those sophisticated facilities. Second, it reveals a way to print semiconductors on a curved surface — something McAlpine says is impossible at those facilities. BETTER VISION FOR ALL. McAlpine decided to tackle the challenge of creating a bionic eye because his mother can’t see out of one of her own,. But people with vision problems aren’t the only ones who could benefit from the devices. Bionic eyes could eventually improve the sight of anyone (though whether they’d have to remove perfectly healthy eyes to implant bionic ones remains to be seen). Still, we’ll first need to figure out a way to convert the electric signals from the eye into something the brain can interpret. That might take awhile. But once researchers make that happen, the rest of us can start thinking about our super-sighted superhero names.